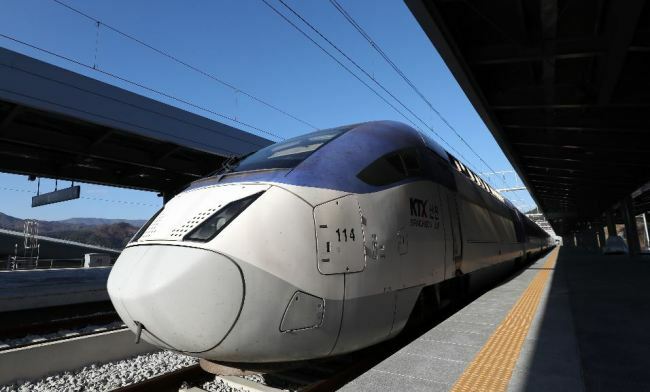 A high-speed train service connecting the gateway city of Incheon, through Seoul, all the way to Gangwon Province where the Winter Olympic Games will be held will begin operation in December. 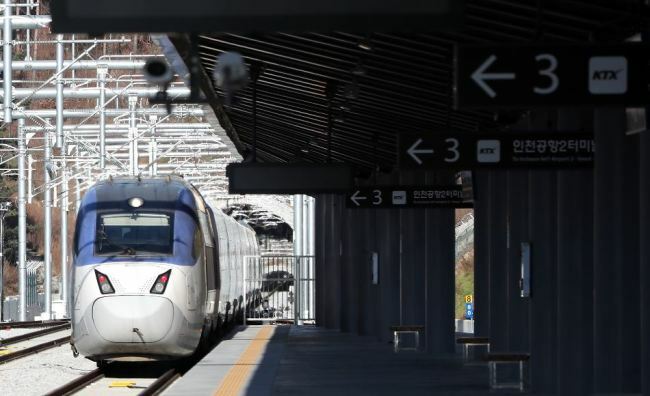 Passengers aboard the high-speed KTX will be able to travel from Incheon International Airport to Gangneung -- one of the host cities along with PyeongChang-gun -- in a little over two hours at a top speed of 250 kilometers per hour. The journey from Cheongnyangni Station in Seoul in northeastern part of the city will take roughly an hour and a half, whereas it would have previously taken five hours. The PyeongChang Organization Committee for the 2018 Olympic and Paralympic Winter Games on Wednesday invited local media on a test-run of the train. Work on the new high-speed train service began in July 2012. Incheon Airport-Gangneung route will operate 16 times a day, while Seoul-Gangneung will operate 35 times, 10 from Seoul Station, 10 from Cheongryangni Station and 15 from Sangbong Station. 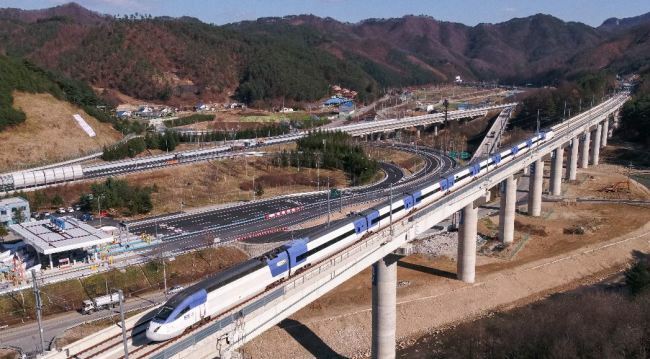 The train arrived at the soon-to-be-opened Jinbu Station, which is about six or seven minutes’ drive from the PyeongChang Olympic Plaza where the opening and closing ceremonies will be held. Visitors can take the shuttle bus from the station to the Olympic Plaza, about a 20-minute ride. Those driving to the venues can use parking lots in Jinbu, Daegwallyeong-myeon, Bongpyeong-myeon -- not to be confused with Bongpyeong-ri in North Gyeongsang Province -- Jeongseon-gun, north Gangneung, west Gangneung, Gangneung Station and Gangdong-myeon. The lots can accommodate up to 10,580 cars, and there will be shuttle buses operating between the parking lots and the arenas. Officials said about 432 shuttle buses will be in service during the games. Those wishing to book tickets for the train can do so from two months prior to the departure date. The official KTX app provides an English-language version for foreigners. The organizing committee is also planning to launch “Go PyeongChang” app, which will provide booking services for transportation along with assisting the users find the shortest routes to the arenas. The beta version will be launched next month, followed by the full version in early January. There is a general sense that things are being rushed. The development of the “Go PyeongChang” app started in March, and testing for the beta version only a month before the official launch appears hasty when many similar apps go through months of testing. “We do admit that we didn’t have a whole lot of time to prepare, but we couldn’t give it up,” said Kang Hee-up, the director general of the transport and traffic bureau at the preparation committee. He stressed that it would be the first time an Olympic committee of any country has operated a smartphone app to provide related operations, in addition to doing so through its homepage and pamphlets. The organizers admitted that there will be “some level of inconvenience” caused by the additional train routes, and appealed to the public for patience. The biggest question at this point appears to be whether the new Seoul-Gangneung line will be sustainable in terms of profit. The reason the trains cannot go faster than 250 kilometers per hour -- the typical top speed for the KTX is 300 kilometers per hour -- is that the tracks were not originally designed for high-speed trains. Ji of Korail said that the government’s original assessment was that a high-speed route would not be sustainable in terms of profit. In addition, the new stations are located far from towns, which means maintaining them could be a money-losing proposition in the long term. Officials currently project that a daily average of 751 people would use Jinbu Station by the year 2026 but they have no estimate for the years leading up to that point, an indication that there is no clear projection yet of post-Olympics demand for the costly infrastructure.